That's what real estate is said to be all about. Some mystery series aren't all about location, but they tend to be inseparable from certain addresses. Is there anyone who doesn't know Sherlock Holmes's famous address? When Arthur Conan Doyle wrote the Sherlock Holmes series, street numbers on Baker Street didn't go above 100, but in the 1930s, the street was renumbered and––presto!––a large building occupied by the Abbey Road Building Society received the numbers 219-229. For many years, the company employed a secretary just to answer the large volume of mail they received addressed to Sherlock Holmes at 221B Baker Street. They enthusiastically embraced the Holmes connection and placed a plaque on the front of the building. But then, a problem arose. 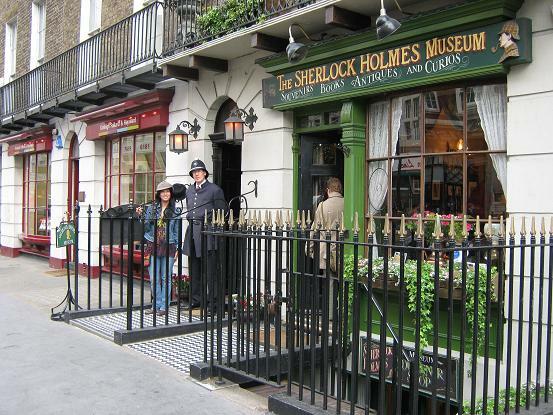 In 1990, the Sherlock Holmes Museum, located at 239 Baker Street, got the head of the local Westminster council to put a 221B Baker Street plaque on their building and claimed the right to receive all mail with that address. This sparked a long-running battle among the museum, the building society, the council and the postal service. The struggle finally ended 15 years later, when the building society moved to a new location. Holmes's office is said to be on the first floor at 221B Baker Street. As you probably know, what Americans call the first floor is the ground floor in Britain, while their first floor is what we call the second floor. When Watson and Holmes go looking for a flat to rent (in A Study in Scarlet), they find 221B Baker Street to be "a couple of comfortable bedrooms and a single large airy sitting-room, cheerfully furnished and illuminated by two broad windows." Blogger Russell Stutler has spent some years figuring out the layout of 221B Baker Street, carefully reading all the stories multiple times. Here is his concept. Note that Mrs. Hudson has a small room off the study and another downstairs, while Watson's room is upstairs. In Conan Doyle's day, Baker Street was a quiet area of residences for well-to-do Londoners, across from Regent's Park. Today, it's a bustling area, with 221B located just around the corner from the tourist mecca of Madame Tussaud's wax museum. Rumor has it that Dorothy L. Sayers picked 110A for Lord Peter Wimsey's street address in a nod to Sherlock Holmes's 220B. 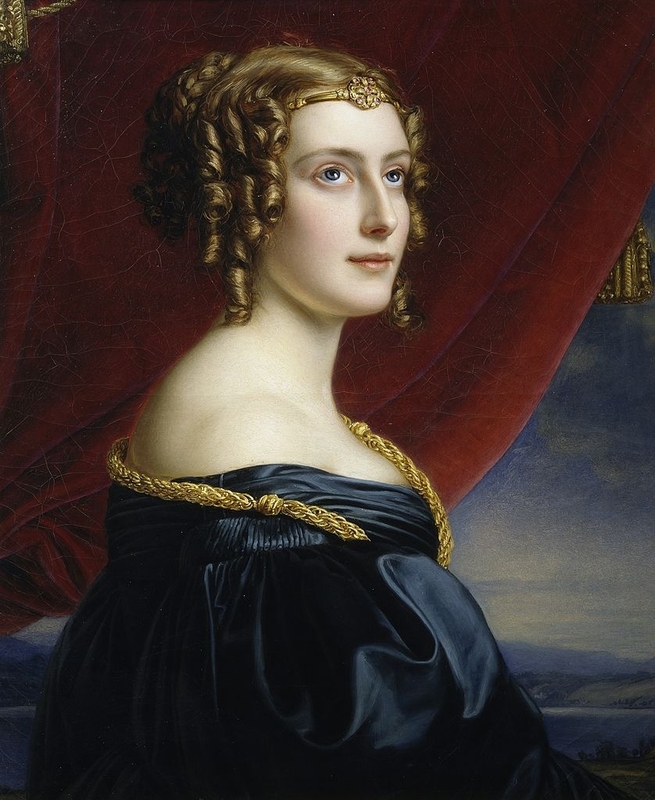 Piccadilly is a good choice for a wealthy second son like Lord Peter. It's home to the Ritz Hotel, Fortnum & Mason and one of my favorite bookstores, Hatchard's. It's described as well-appointed, with a welcoming fire and many, many bookshelves filled with rare editions. Not surprising for a man who is an expert on incunabula (books printed before 1501) and who often has a book auction catalog at hand. There is no 110A Piccadilly, but there is a 110 and, disappointingly, it's not a house or a block of flats. It's the Park Lane Hotel. More specifically, 110 would be about where the ballroom entrance is. Take a look. It's to the far right in this photo of the hotel. At least it's across from Green Park, so it would be a nice location if Wimsey did actually live there. After Lord Peter Wimsey marries Harriet Vane, he and his man, Bunter, say goodbye to Piccadilly and hello to, not Leicester Square, but Audley Square, not far away in Mayfair. The couple move into a place referred to as Belchesters' House, which has a library upstairs with a bookcase that conceals the entrance to a secret room that Harriet adopts as her writing room. Some contend that the model for the couple's Audley Square house is Number 2, which was a private home built in 1876 and now houses the University Women's Club. That seems an apt location for Sayers and Harriet Vane. I like to think of Harriet and Peter strolling the one block to one of my favorite places in London, the lush, green and quiet Mount Street Garden. In Busman's Honeymoon, we learn that Lord Peter buys Harriet a wedding gift of Talboys, a rustic old farmhouse in the village of Paggleham in Hertfordshire where Harriet grew up. They plan to use it as their country home and honeymoon location. When they arrive, they find Talboys not ready for them as arranged. It's locked up tight and it takes some time to gain access. Next morning, they find the chimneys completely blocked––and an even worse find is made in the cellar. 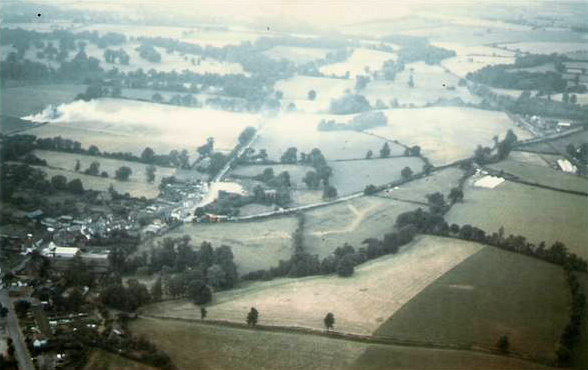 There is no village of Paggleham in Hertfordshire, but there is a Puckeridge that kind of works for me as a place to imagine the Wimseys' country living place. Dashiell Hammett lived in this building from 1926-1929, and wrote Red Harvest, The Dain Curse and The Maltese Falcon while living there. 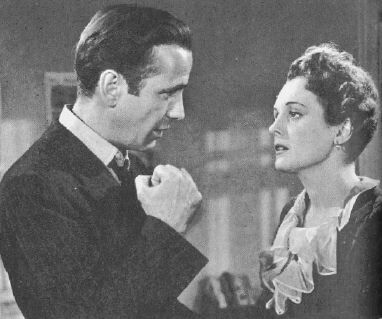 Famously, Hammett placed Sam Spade's apartment there in The Maltese Falcon. 891 Post Street. Apartment 401 is the top apartment on the corner directly facing the camera. Today, the apartment building has a coin laundry on the ground floor and a parking garage across Post Street. It's on the corner of Post and Hyde, in the Tenderloin. Not the best neighborhood, but the nicer part of the neighborhood, at least, and realtors like to call it Lower Nob Hill. Recently, an apartment was for rent in the building for $1,450 a month. What do you suppose Hammett's rent was for his modest studio apartment? There is some disagreement, but most seem to think that Hammett––and Spade––lived in Apartment 401, on the northwest corner. The Friends of Libraries USA plague on the outside of the building states it as fact, so let's just go with it. 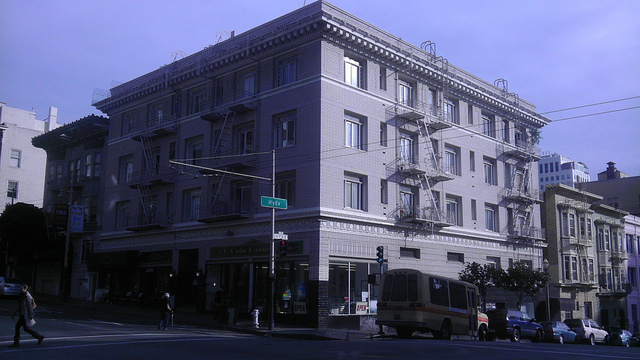 Mystery writer Mark Coggins has a nice story about the apartment here. 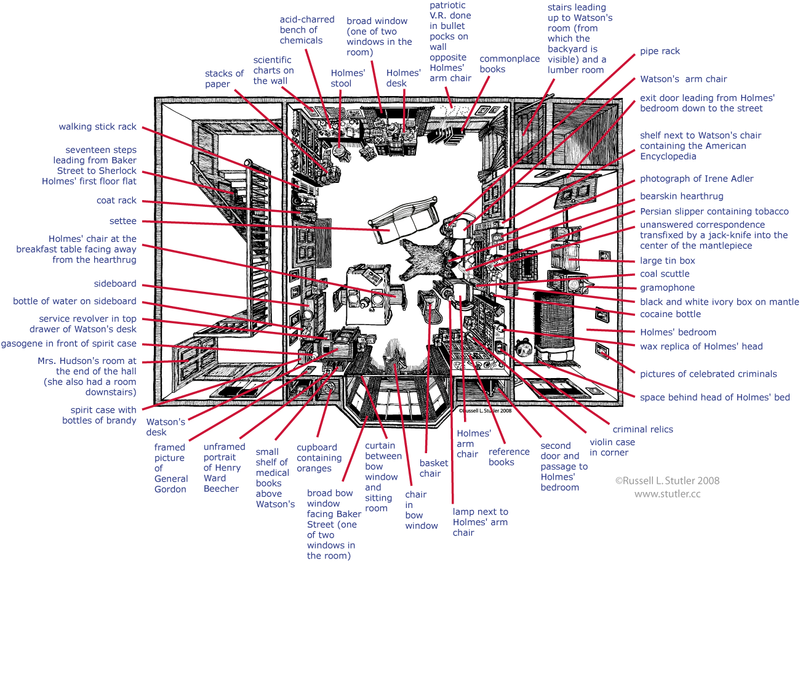 Here's the illustration on his site of the floor plan. 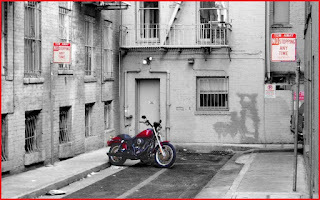 It's not a very inviting spot, but as long as you're in the neighborhood, you might feel compelled to take a stroll over to the alley where Sam Spade's partner, Miles Archer, got plugged. There is even a plaque at the entrance to the alley, just off Bush Street above the Stockton Tunnel. Note that the plaque should have a big **spoiler** mark on it! A guy named Don Herron has been leading a Hammett tour for 35 years. I'm sorry to say I never heard of it when I lived in San Francisco. But if you're interested, he starts out at noon every Sunday in May and September, and it costs $10. If you can't make it in person, Herron has published a book about it called, unsurprisingly, The Dashiell Hammett Tour. 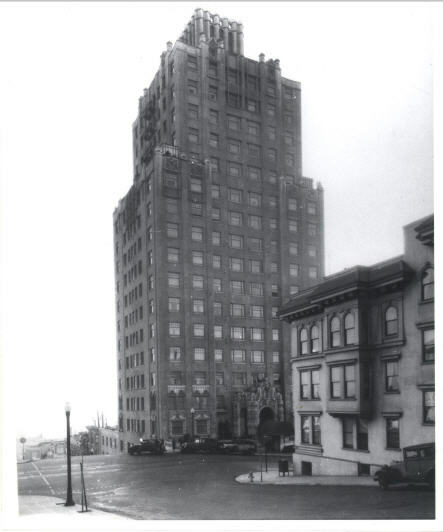 Another stop on the tour is at 1201 California Street, at the peak of Nob Hill. The Cathedral Tower there is thought to be the model for the Coronet apartment building, where Bridget O'Shaughnessy lived. I'm sure she missed her great view of the Golden Gate when Sam Spade sent her to the joint. 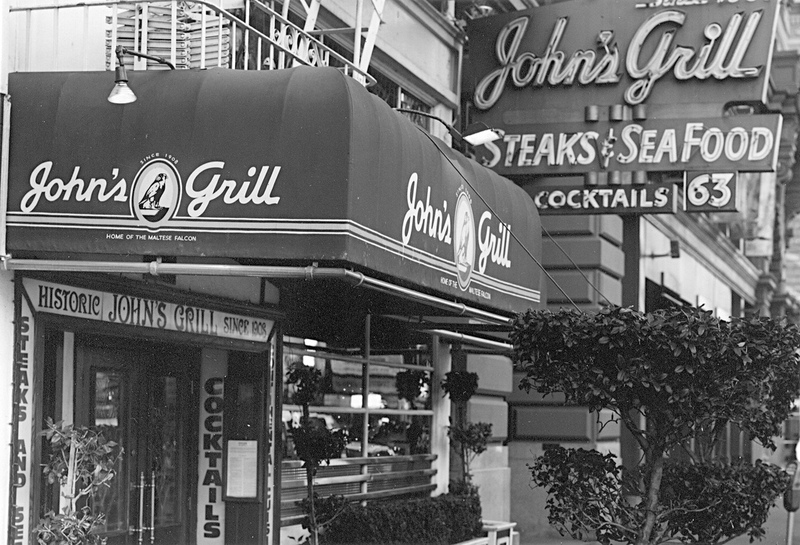 Don Herron winds up his tour at John's Grill. Sam Spade ate there, so maybe you should give it a try sometime. You can even order the dinner Spade had there: lamb chops with sliced tomatoes and baked potato. Before you pay the bill, check out the replica of the Maltese Falcon upstairs. Rex Stout's Nero Wolfe loved his home, a luxurious Manhattan brownstone. And what's not to like? Three stories with a rooftop greenhouse for Wolfe's beloved orchids; quarters for two live-in staff members, including Fritz the cook, and Wolfe's wisecracking assistant, Archie Goodwin; an elevator to take the rotund Wolfe up and down; a richly comfortable office with Wolfe's custom-made chair. Ken Darby, author of The Brownstone House of Nero Wolfe, claims there were never any brownstones on West 35th Street. Darby speculates that the actual location Rex Stout had in mind was Gramercy Park, probably East 22nd Street. 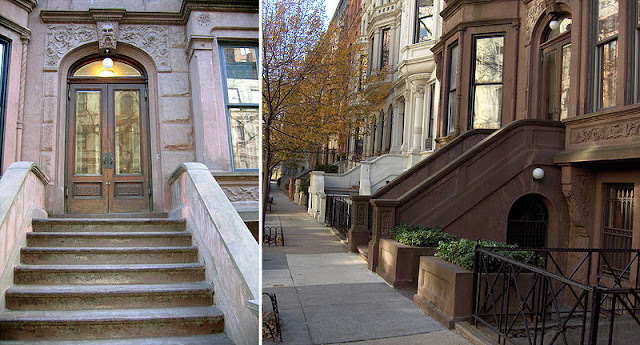 The Nero Wolfe series televised by A&E used a lovely brownstone at 44 West 76th Street to stand in as Wolfe's place. 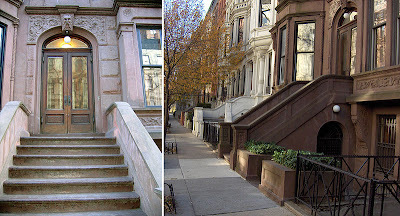 Because this brownstone has more than the seven stairs in the front that Rex Stout described for Wolfe's home, the filmmakers were always careful to shoot the front so that it didn't show the stairs or only showed seven of them. Now that's attention to detail! Speaking of which, for a whole lot of detail about the layout of the brownstone, check out John Clayton's blog here. To find out everything there is to know about Nero Wolfe, Archie Goodwin, the brownstone and all of Rex Stout's Nero Wolfe books, our own Georgette is the source. One of these days, I hope she'll write about Wolfe. After all these big city apartments, it's time to visit a less conventional home for a beloved sleuth. 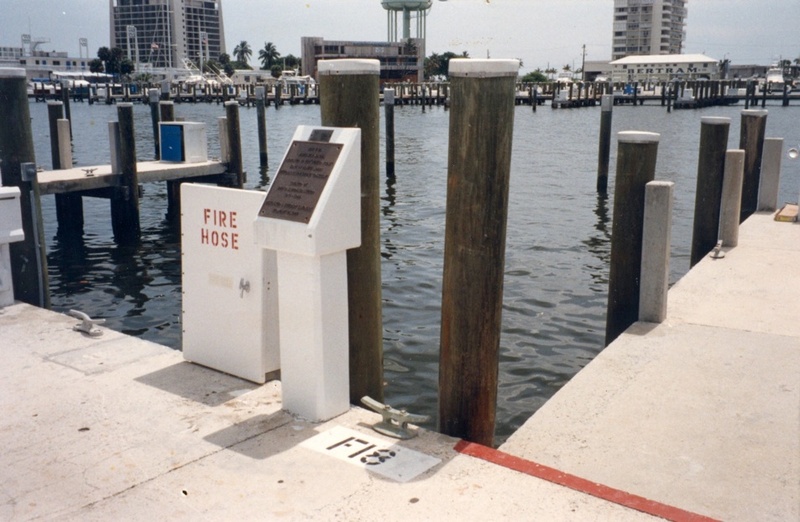 John D. MacDonald's Travis McGee lived on a houseboat called Busted Flush, berthed at Slip F-18, Bahia Mar Marina, in Fort Lauderdale. He gets a plaque from Friends of the Libraries USA too, which you can see in the photo below, just to the right of the fire hose sign. This isn't really where a berth F-18 would be in this marina's layout, but it's the thought that counts. Nice of the marina to care enough about McGee's fans to recognize him. And MacDonald must have appreciated it too. Not just the recognition, but that it kept fans focused on Fort Lauderdale, rather than on Sarasota, where he lived. The Busted Flush is named after a poker hand, naturally. 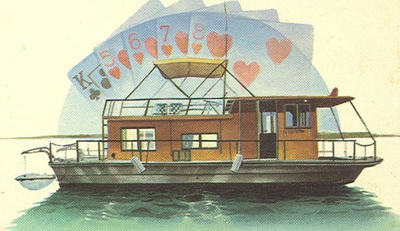 In this case, McGee was losing hand after hand, then bluffed a flush and got this 52-foot barge-style houseboat as his payoff. McGee doesn't get to spend much time there, because his cases take him all over, but when he can, that's where he kicks back with a Boodles Gin, enjoying life. Wherever you call home, I hope you have living companions as tolerant as Holmes's, as loving a life companion as Lord Peter's, as beautiful a home town as Sam Spade's, as much room for your favorite hobby as Nero Wolfe, and as low a purchase price as Travis McGee's. Great post, Sister. I will definitely be posting about Nero Wolfe in the future. I love that series. I'm so glad someone at NBIE mentioned this post, Maine. You gals are getting so clever...I must visit more often.